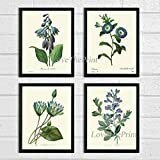 Beautiful set of 4 prints based on antique botanical illustrations from 1841. Wonderful details, colors and natural history feel. This entry was posted in Gardening Equipment and tagged Antique, Bindweed, Blue, Botanical, Daylily, Decor, Flowers, Glory, Home, Indigo, Lily, Morning, Print, Prints, Room, Unframed, Wall, Water, Wild, Wildflowers by Lawn Advice. Bookmark the permalink.